The Empathy Coat is an emotional supplement device. It's designed to transmit touch and be emotionally conductive. 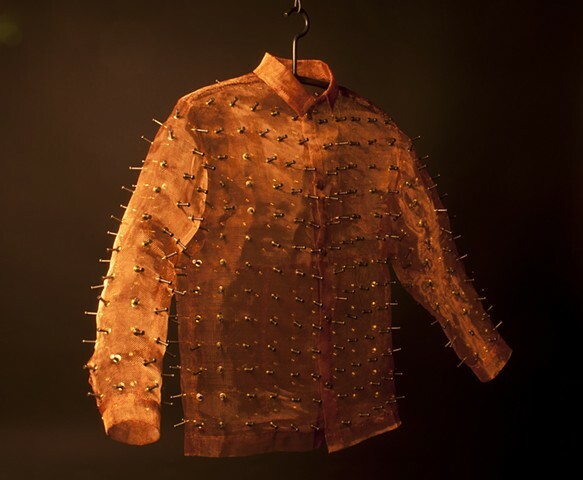 Hand sewn from copper screen and wire, the coat is fitted with 533 sprung nails mounted in brass grommets.This piece is part of an ongoing dialogue in which the puncture object serves to cross the boundary between interior and exterior and the fear of perceived threat as an emotionally limit constraint. The grid serves as a rational system to manage otherwise discordant, hysterical, and conflicting feelings about how we each relate to other people and the world around us.